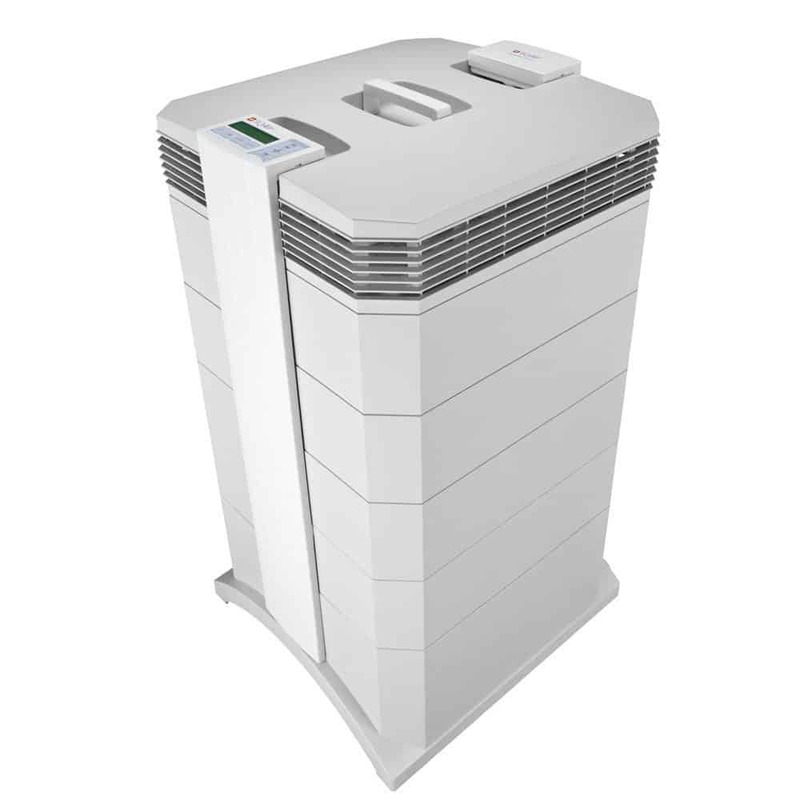 IQAir HealthPro Plus air purifier is called the world’s most advanced air purifier. It has many #1 product reviews and it is one of the best for allergies and asthma. This model is for spaces up to 1125 square feet (105m2). It cost more than $750. Is it worth the money? Read below to get an answer. The IQAir HealthPro Plus is a big machine, measurements are height 28 inches (71cm), width 15 inches (38cm), depth 16 inches (40.5cm). But it looks great, it is designed so well, that it doesn’t look so big. An air purifier is manufactured in Switzerland using fully cured, high-grade, injection-molded ABS plastic. This material resists scratches and dents, and it’s highly impact-resistant due to a 3-millimeter housing thickness. The best place for the IQAir HealthPro Plus is a floor. The air intake is on the bottom of the unit. The air outlet is at the top of the unit with air distribution in all directions. (It has 320° EvenFlow diffuser). You can also get a wall mount bracket. 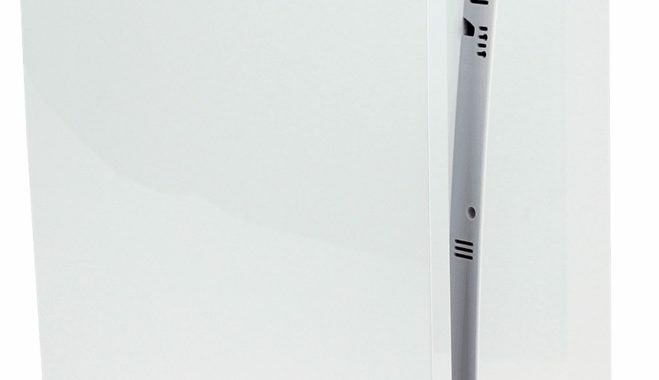 The IQAir HealthPro Plus weight is 35lbs (16kg). That is like a European standard kettlebell. The built-in guiding handle on the top and sturdy casters on the bottom of an air purifier make it simple to roll around the house. The air through this machine is moved by a fan. 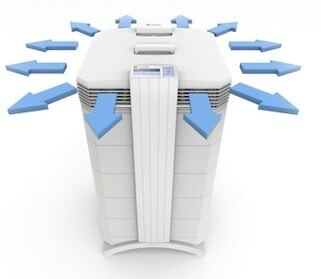 The HealthPro Plus air purifier has an advanced 3-stage filtration system. First is pre-filter also called as PreMax. 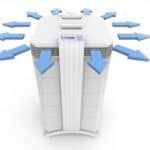 It removes 90% of the particle weight from the air going through the air cleaner, allowing the HyperHEPA filter to last up to five times longer than similar filters in ordinary air cleaners. 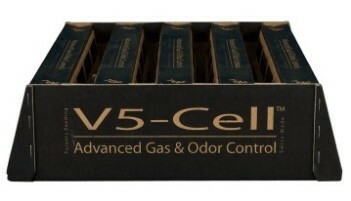 Second is V-5 cell gas and odor filter. This filter uses granular activated carbon adsorption to eliminate volatile organic compounds (VOCs), the cause of many unpleasant odors. This filter also uses pelletized chemisorption to destroy other harmful chemicals like formaldehyde. I bet you have read reviews that say about a chemical, plastic – type of smell coming from this filter. Not anymore, the manufacturer has eliminated this problem. The third is HyperHEPA filter. This is better than the true-HEPA filter. This filter removes particles as small as 0.003 microns with a guaranteed minimum efficiency of over 99.5%. This is 100 times smaller than True-HEPA can filter. So that means this air cleaner captures almost everything – viruses, bacteria, pet allergies, mold spores, pollen, dust, materials used in the building such as asbestos, formaldehyde, and lead. Full-Featured Electronic Control Panel – The easy-to-use electronic control panel helps you select a fan speed, view remaining filter life, program the advanced timer, and set date/time. Casters – Four smooth-rolling casters make it easy to move this unit from spot to spot for clean air anywhere. The New Edition has an average of 7% less sound across all fan speeds, without sacrificing filter life or system efficiency. 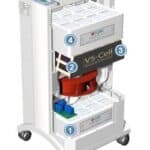 This system is virtually inaudible on its lowest fan speed, making it great for noise-sensitive environments like libraries, nurseries, and bedrooms. The second and third speed is also quiet. Loudest is the sixth speed, but that is ok because with this speed air cleaner moves a lot of air. The IQAir HealthPro Plus is not tested by AHAM, so it is not CADR rated. CADR ratings are never given out for whole-house air purifiers because the’re measured differently. 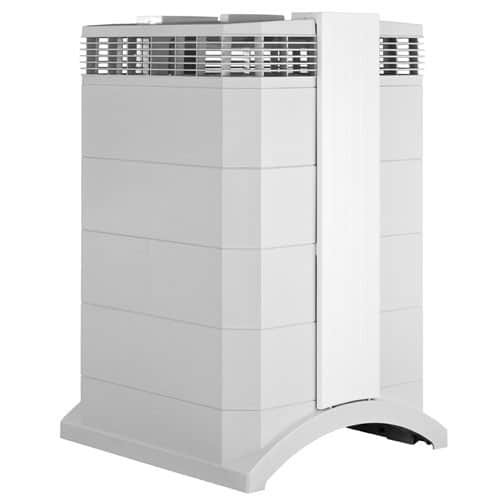 This unit is designed to be much more efficient at cleaning the air than less expensive units. You can compare the air delivery (in cfm – cubic feet per minute) of this unit to others to get a general comparison. Air delivery with speed 1 is 40 cfm. Air delivery with speed 6 is 240cfm. IQAir recommends running your IQAir HealthPro Plus air purifier for 10 hours a day on speed setting 3. Thanks to its superior performance and filtration, it does not need to be run 24 hours, 7 days a week. Of course, you will use it with different speeds and time than recommended. IQAir HealthPro Plus is equipped with an electronic filter life monitor which will show you the remaining life of the system’s filter elements. As I have noticed, in reality, these numbers are close to ones outlined above. Filters change is simple. Just realize the locking arms and slide the filters out of the frame. The IQAir New Edition costs very little to operate. It only requires about as much power as a conventional light bulb. At the very heart of these air purifiers are the ultra-efficient IQAir New Edition fan and its maintenance-free motor. This amazing powerhouse requires as little as 20 watts of power at the lowest speed and up to a maximum of 135 watts at the highest speed. As a result, it costs only pennies per day to operate. 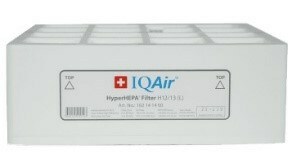 The IQAir HealthPro air purifier works excellent, it captures airborne pollutants as small as 0.003 microns. It has one of the best air filtration systems in the market. And that is an incredible number. Surprisingly great air cleaner for big size space up 1125 square feet. It has a lot of features that you will enjoy. The only reason that can stop you is a price. But I would say it is worth that. Really great filtration system. HyperHEPA filter alone removes 99.5% of allergens as small as 0.003 microns. That’s 100 times smaller than what a conventional HEPA air purifier filter can remove. Many features – remote control, electronic controls, 6 fan speeds, timer, filter replacement time, carrying handle, casters etc. Size – you have to prepare to leave space for this air cleaner. 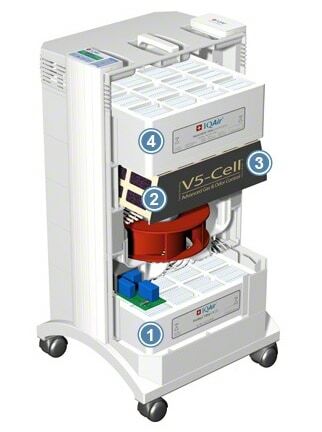 The old model had a chemical smell from V5-Cell filter that new model does not have. But that left a gap in reputation. 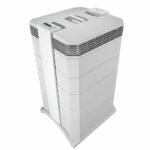 Posted in Air Purifier Reviews, Reviews and tagged Air Purifier, Air Purivier Review, HEPA, IQAir.